We have somebody working on the 4th review. Sorry for it taking so long, but we haven't forgotten. Rampage is on a... rampage through the SoV once again, but does he have what it takes to go the distance? Rampage used to be a tiny Frost Giant, now he's a tiny, speedy Krug that's always half-angry and doesn't have bonding. He's got a rather different powerset now, but he is still looking a little juiced for his points. There isn't much meaningful change here compared to last time, he's still a Warforged with anger issues, except that now there is an active reason not to have him in the same army as one of the other Warforged since Siege and he both want the X Marker. Seeing as the Warforged already don't work together in any meaningful sort of way, I'm not a big fan of this 'anti-synergy' further discouraging a thematic build, but I can live with it. Rampage still has two reused powers, but now his one unique power is a bit wonky (more on that in Playability). This design just doesn't work for me here. Rage offers no tension or choice; you always want it on if you're taking turns with him, his high life and Warforged Resolve mitigate the defense loss, while gaining move and attack are huge benefits for a melee figure with wound contingent double attack. However, unlike Evar, there isn't a penalty for losing initiative or not taking turns with him. For all the “X” Marker rigmarole, the power just boils down to 'if Rampage hasn't taken a turn this round, add 2 to his defense'. It isn't very interesting to use and the illusion of choice saps the fun out of playing him. I stopped testing after he failed the fun test, but he continued to feel too strong for his points as well. That's mostly irrelevant at this stage though, I don't feel Rage is workable on this card regardless of any changes in point cost. Personally, this felt like a step backward from the last version of Rampage. It's an ok custom, but I don't think it has a place in the SoV in this incarnation. I have a few announcements to make. First, infectedsloth has stepped down from his position as a Judge. His fine contributions to the project are appreciated and I wish him the best in his future endeavors. Given the low number of units currently in pipeline, we are not looking to fill the position at this time. If things pick up we may reevaluate, but for now we are comfortable with six. Rampage by @William099 has received to Nay votes to induct (Scytale and Soundwarp SG-1) and is removed from the process. Urk by @Ninja Status and @superfrog has received four Yea votes to induct (Scytale, Soundwarp SG-1, wriggz, and Ixe) and has passed SoV judging. It will move on to final approval from United Fanscape. I would like to nominate my custom, the Marro Vector. An Uncommon hero for the swarm that helps transmit the parasitic Gnids. He is a very kamikaze type unit; you will want to run straight for your opponents heroes while ignoring and taking leaving engagement attacks from screens. Their high life, great mobility, and lethal attack make it possible to rush in and pass a Gnid. In play testing him, I have found that two Marro Vectors and a single squad of Gnids is a really fun addition to an army. Theme: Another genetic creation of the Marro that is designed to transmit other Gnids seems very much in line with the theme of the Marro. The Gnids by themselves are weaker, so using a host to transmit them makes sense. Availability: As a repaint of an official unit, Abomination, this should meet the requirements for availability. Since hit zones will be the exact same, Abomination does not even need to be re-painted to be viable in tournament play. I am excited to submit this. It has been a bucket list item to submit something to the SoV since they started. So, whether the Marro Vector moves on or not, thanks for running this thing guys. And thanks @qt.bangerang for coming out of the shadows and helping me put this guy together in card form. I am intrigued by the custom design and more than willing to test it, but I have some reservations about the figure involved. While SoV has allowed a repaint before with Tyrian the Kyrie Warrior, I think that case was exceptional in that it was a readily available common squad figure and the paint job was a simple color swap. This runs counter to pretty much every point in Tyrian's favor. I do not know how many VC players actually have Marvelscape (I personally don't) and if they do if they'd be willing to repaint a figure from it. Ultimately, the paint job seems extensive enough that we might as well be dealing with an unpainted figure (which SoV does not accept). For that I vote NAY to accept Marro Vector for review. I'm dubious about the painting, but more so about the "Marroishness" of the figure as a whole. I mentioned in another thread I felt this figure was lacking the skeletal figures, and I still feel that way. I also expressed concern about a 50 point figure only getting off one attack of five after investing 12.5 to 25 points of Gnids, and half an order marker to charge him up, which seems could only happen in the start zone. As suggested 150 points (2 vectors, 1 squad of gnids) seems like a heafty investment for what amounts to 2 attacks on a key target (which may not be reachable or even present). Though this is admittedly Theroyscaping and play testing may show the investment is worth it. I'm also not partical to purely Kamikaze units, and heroscape as a whole has not been kind to them either. For now the Figure paint investment and look, drive me to vote Nay. 'Desert Sneak Attack Abomination' does not a Marro make. Especially an uncommon one that people would feel the need to paint multiplies of. I also don't think 'it's an official figure' some how magically makes it meet availability standards, espeically since it's an official figure a large part of the VC playerbase might not have ever gotten, I'd have to see some actual numbers showing there were still plenty to be had online. Beyond that, I don't really care for the design as it stands. This guy's only real use is as a kamikaze, but you're expected to waste time equipping Gnids to him before charging out hoping to hit something... except with an attack of 5 I'm pretty sure I'd just say nuts to that and just start the probably-futile-anyway charge right off the bat and hope I get a few decent wounds in. A kamikaze that is also a bus for other kamikazes just seems like a good way to muck things up. Overall, I don't think the Gnids really benefit from having a 'big boy gnid' around*, and the figure is pretty much a non-starter for me. *Personally, I think it would be a lot more interesting as a more durable, less punchy figure that could place gnids with a D-20 roll or something, give the nids something to cover some other bases instead of just 'me, but bigger' ya know? The Marro Vector by Tiranx has received three Nay votes to review (Ixe, wriggz, and Soundwarp SG-1) and is removed from the process. I am thankful for the submission, however (as I always am). Things have grown quiet here for a while so it's nice to see some renewed interest. Something I forgot to mention: Tyrian is a unique case where he is an existing character from the lore that we know to look exactly like a Protector. Which gave justification for the judges of the time to accept him in spite of the fact that he was a repaint, not because he was one*. So, to get my vote at least, a nominee is going to have to have a similar reason for being a repaint. I see Tyrain as a rare exception, not a license to use repaints for just any nomination. *and this was back when Heroscape figures were a lot easier to acquire and we weren't getting new people coming into the game post-cancellation that might not have anything beyond a master set. Last edited by Soundwarp SG-1; October 17th, 2016 at 06:21 PM. That is an interesting idea Soundwarp. I am not really married to the figure. So, maybe I will find something else suitable in the future. You have me thinking of the Zerg queen on Starcraft with that concept. Thanks everyone for your consideration. I feel like this set a good precedence on what is acceptable for repaints. You guys mentioned Tyrian when I always thought about the Gencon exclusives as justification for repaints of originals. This was a fun exercise in custom making. Honestly, I'd say it would be more feasible if it were a Unique Hero - that may just be my being someone with two Marvel sets talking, but people would be more likely to have/more able to get their hands on a single extra Abomination. 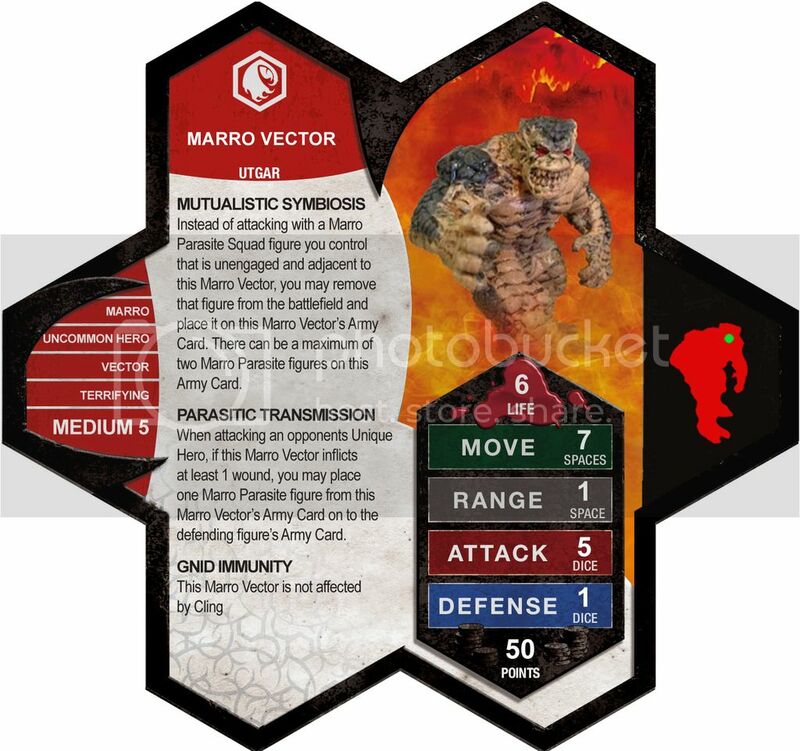 It may also be worth looking to see if there are any Heroclix Abomination figures who'd make a decent proxy? Maybe? ~ Lazy Orang, now wondering about a series of customs made out of my extra Marvelscape figures for Super/Classicscape.